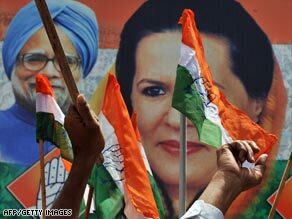 Indian Prime Minister Manmohan Singh is set to reclaim a second term with a resounding mandate for his Congress party. Singh, seen as architect of India’s economic reforms in the 1990s, will be the second Indian prime minister since Jawaharlal Nehru in the 1960s to hold the post twice after a full five-year term. His Congress party, headed by Italian-born Sonia Gandhi, alone won 205 of 543 boroughs of the federal parliament — its best performance since 1991 in a country that has been governed by coalition governments for most of the past two decades. Congress and its allies together led in 262 boroughs, outpacing their Hindu nationalist and communist rivals in the month-long general elections. Singh will submit his resignation and that of his council of ministers on Monday to President Pratibha Devisingh Patil to be able to make a fresh claim for government formation, presidential spokeswoman Archana Datta told CNN. Indian election commissioners will also be submitting a list of new elected contestants, she said. Meanwhile, the Congress party met in New Delhi to discuss how to form the next government. The alliance it leads is about 10 seats short of a majority in parliament, a gap it is expected to fill with some extra backing of smaller groupings and independent winners. Last year, the ruling Congress-led alliance lost support of communists for signing a civil nuclear cooperation agreement with the United States. Nonetheless, it survived the power test with backing of a regional party.